The newly opened first floor area known as Speakers’ Corner will host much of Falvey’s programming, replacing the 24/7 Holy Grounds lounge as the Library’s primary event venue. “We are very excited about having a dedicated space for events, given the number that we host throughout the year,” said Darren Poley, Outreach librarian. Falvey inaugurated the new Speakers’ Corner area on Thursday, Feb. 9 with an Irish Studies event featuring poet Daniel Tobin. This year’s One Book Villanova author, Jamie Ford, also signed books and engaged students in discussion in the Speaker’s Corner during his Jan. 31 visit to campus. 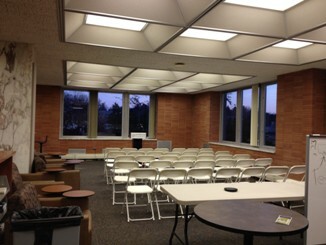 Speakers’ Corner is one of three new event spaces in Falvey. Rooms 204 and 205, located in the new second floor Learning Commons, are also available for events. Room 204 has already hosted this semester’s first Scholarship@Villanova lecture as well as two installments in the continuing New York Times video conference series. When Speakers’ Corner is not host to lectures or other events, it is open as an additional lounge area. It is home to dozens of new lounge chairs, study tables and the current journals and newspapers.